I don't know about you but I enjoy trying new shampoos and conditioners. My hair has grown a bit in the past couple months which is great but I do find I need to keep on top of washing and so find I go through shampoos and conditioners quite quickly. 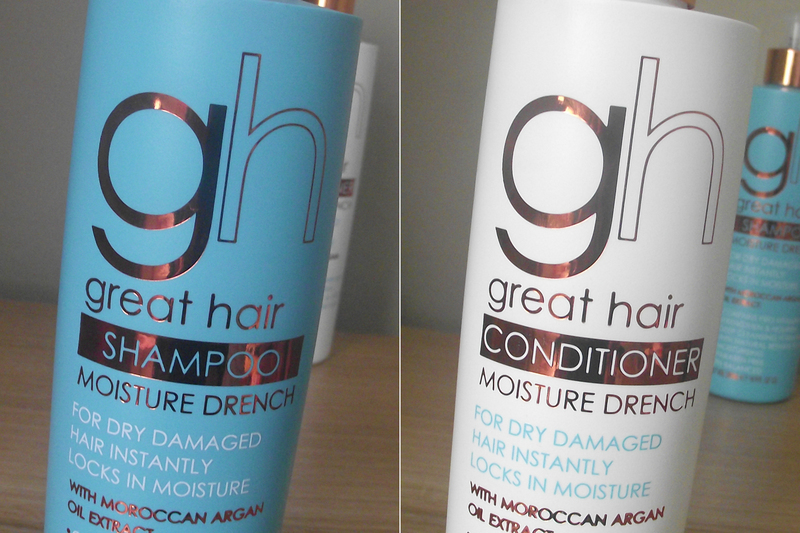 When I saw the packaging for the new Baylis & Harding Great Hair moisture Drench Shampoo* and conditioner* I immediately thought Moroccan oil. I love the big chunky pump bottles and the vibrant turquoise shampoo bottle and white conditioner bottle. I couldn't get over the price of these bottles. They're both are whooping 500ml and retail for £6 each which is fab. Moroccan Argan Oil has been classed as a top key ingredient for hair care. Other products containing the key ingredient often come with a high price tag but thankfully we can now have the benefits but also have some extra pennies in our purses. The Moisture Drench Shampoo & Conditioner both contain the Argan Oil extract also know as liquid gold. Especially formulated to hydrate and nourish dry/damaged hair. After using both products my hair looks and feels soft and in great condition, shiny and sleek.I've also noticed the colour of my hair look brighter and overall more healthy. These are well worth the money. The conditioner isn't a thick creamy conditioner, so if you prefer the thicker conditioners then give this one a miss but I would still recommend you try the shampoo. If you have oily hair which gets greasy quickly this conditioner would be perfect for you! Another good factor to point out- both are pH balanced, paraben free and include Pro Vitamin B5. The Great Hair Moisture Drench Shampoo & Conditioner are available exclusively online at www.baylisandharding.com and in store at Debenhams. Will you be picking these up next time you pop into Debnhams? Hiya, I saw these products in ASDA yesterday, they are on the 3 for £10 offer, which you can mix and match with any other product with the offer label on. I only bought the conditioner, as I bought some JOHN FREIDA shampoo for blonde hair in with the offer. The packaging is lovely and there is definately a lot of it but, as mentioned above it is not a creamy product, so I felt I needed to use more than usual. I love Moroccan oil and Argan oil products, but unfortunately I didn't find that this one left my hair as smooth as other conditioners. I have really thick, wavy hair and lately it has become very dry and damaged looking (I color it). I usually let my hair dry naturally after I wash it because it's such a pain to blow-dry. It always poofs and frizzes when it dries. I've tried all kinds of deep conditioners and masks, and nothing seemed to work. I used the Shielo Smoothing Shampoo and the Shielo Conditioner and noticed immediately when I was combing it that the ends didn't feel brittle and my hair looked shiny. It actually dried curly instead of frizzy and is really bouncy! I love Shielo - and te smell is amazing!!! I have long fine dyed hair so I thought I would give this a go. After using it three times now, I am very disappointed. I like a creamy conditioner that allows me to pile my hair up while I shower so I get the full benefits. I couldn't do it with this product as it seemed to disappear as soon as I applied it. My hair also took an age to de-tangle and when dry (I only ever air dry), I found the static in my hair awful. I live in an area with hard water and I wonder if these products are only tested with soft water. I have just ordered a shower head with an inbuilt filter and so I will try again when that has been fitted and then write another review. I have long, fine, dyed hair and am always on the lookout for a product which doesn't involve buying several separate items, so I thought I would try this shampoo and conditioner. Unfortunately, it did not live up to it's claims for me. I like a conditioner that I can apply and then pile my hair up while I shower. I couldn't with this product as it seemed to disappear as soon as I applied it. Also, after showering, my hair took an absolute age to de-tangle and when my hair was dry (I only ever air dry), the static was awful. I live in a hard water area and wonder if hair products are only tested using soft water. I have now ordered a new shower head with an inbuilt filter, so once that is fitted, I will try again and write further comments.